As we begin our weekly superhero adventure we find the USS Defiant (a sub, not the ship from Deep Space 9) cruising along beneath the ocean just minding its own business. Out of nowhere another mysterious sub appears and opens fire. The Defiant sinks to the bottom of the ocean. Inside the mystery sub the captain is none other than “scruff looking, non-orange tunic wearing, I have a hook for a hand” Aquaman. 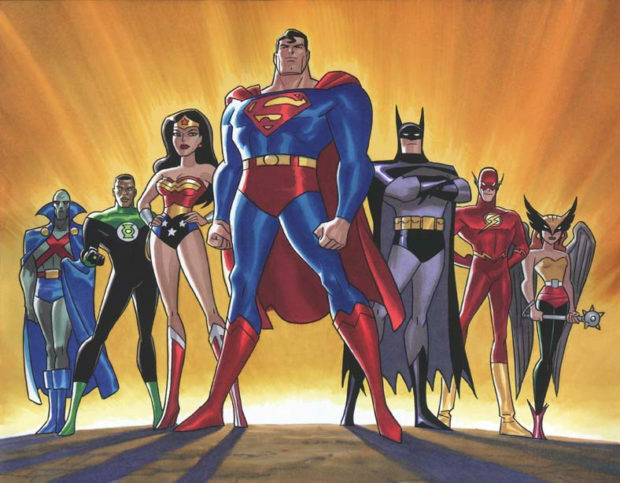 The Justice League’s own multi-environment ship, Javelin, arrives on the scene with Green Lantern, Superman and Wonder Woman to rescue the Defiant. They are met with hostility and gunfire by three Atlantean subs. Ditching the Javelin, they fight hand to sub. After they disable the subs, Aquaman and troops arrive on Atlantean jet skis and order them to halt. Superman asks if he can rescue the Defiant crew. Aquaman agrees, but says the sub itself has to stay. Green Lantern puts up a fight since it’s a nuclear sub, but Aquaman tells him he doesn’t have much of a choice. As the Justice League depart with the rescued crew, Superman tells Aquaman that it doesn’t have to be like this; he should have made his complaints known to the World Assembly. Back in Atlantis, General Brock tries to convince Aquaman that the surface dwellers are a threat and that his troops should wipe them out. Aquaman tells him that he will think about it. Lord Orm, Aquaman’s half-brother, watches on. Aquaman retires to his Aquahouse to talk the situation over with his wife (Mera) and play with his newborn son. 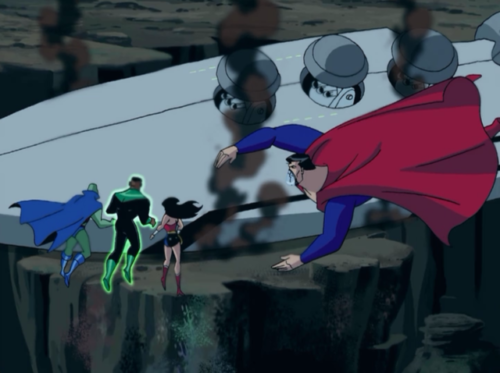 In the Justice League Watchtower, Green Lantern tells Wonder Woman and J’onn J’onzz what a mistake it was to leave the Defiant in the hands of the Atlanteans. He decides to go out on his recon mission back to the sub and he finds the nuclear weapons missing. He reports his findings back to the JL. Aquaman has apparently reached a decision as he walks out of the ocean and goes to the World Assembly. Rather than discussing his issues with the Assembly, Aquaman lays out his demands. This is met with much bickering and debate. GL, WW, MM and Supes show up to try and calm Aquaman down but he storms out of the building. That turns out to be a bad move as a mysterious sniper with a bazooka is waiting on a nearby rooftop and fires it at Aquaman. He gets away while the JL take Aquaman to Metropolis General. General Brock and his troops catch the news report of the attempt on Aquaman’s life on ANN. Lord Orm decides to take over the throne and make the humans pay for their treachery. Things look bleak back at Metropolis General since none of the doctors know how to heal Aquaman. Fortunately Batman shows up with the formula for seawater and a bacta tank. A few minutes later Aquaman is fine and wants to find out who tried to kill him. Next we see Aquaman leaving the hospital and once again our mystery sniper shows up to try and kill him. A well placed batarang stops that (couldn’t Superman have done it quicker?) which is no biggie since Aquaman turns out to be J’onn J’onzz in disguise. The sniper makes a get away on motorcycle. The JL chase him for a while, causing a lot of unnecessary damage to streets and buildings by the way, and eventually catch him. The assassin turns out to be Deadshot (voiced by Michael Rosenbaum, doing double duty.) He refuses to talk, but Batman takes him aside and whispers something to him. Suddenly he’s willing to help. However, he doesn’t know much about the people that hired him, just that he was paid in Spanish Doubloons. Meanwhile, the real Aquaman has returned to his throne room to find Lord Orm rallying the troops. He orders them to stop, but his orders go unanswered. Lord Orm accuses Aquaman of being a traitor and has him taken in to custody. To be continued… Can’t say we didn’t see that coming a mile away. Like the previous arc, this plot line was pretty paint by numbers. No real surprises, but an enjoyable half hour none-the-less. Batman made his first appearance since the pilot and is about the same as he was on his own show. Flash and Hawkgirl were nowhere to be found proving that it’s hard to get all seven members into one story and maintain focus. Green Lantern did more this week than he has in the previous shows, but he has a very different vibe than comics readers usually see. In the show he has an almost post-military persona, as opposed to his literary occupation of architect. I hope they fill us in a little more about his background.